Hoi An, Vietnam - May 10, 2018: Handicrafts man repearing the parts at fair of crafts and jewelery, ceramics . Asian arist working with a flaming torch and lame from blowtorch. Low light in Workshop. hd00:06PORT OF TACOMA WASHINGTON USA, AUGUST 2013, LCU 2033 Paulus Hook ship moves into the harbor. The captain is on the bridge of boats. He alternately accelerates. 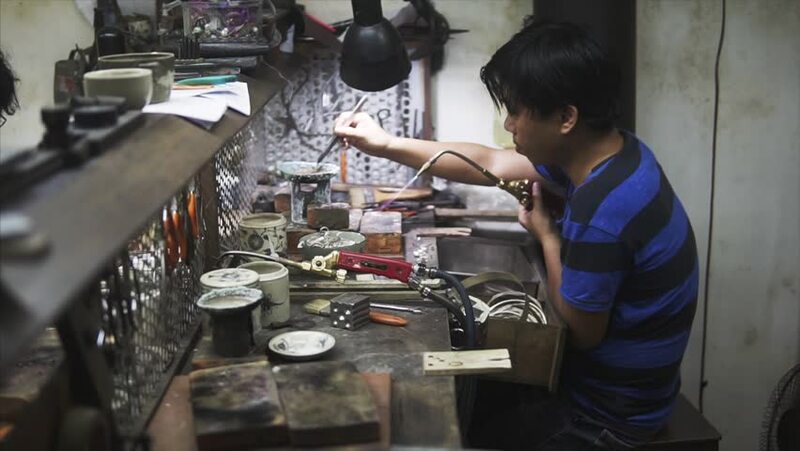 hd00:19BANGKOK - NOVEMBER 8 : Unidentified watchmaker in his workshop repairing a wrist watch at Floating Kwan Riam on November 8, 2014 in Bangkok, Thailand.